Edward, 1st Viscount Cardwell, was born in Liverpool in 1813. After a distinguished academic career at Oxford - a double first and a fellowship - he went into politics and from 1868 until 1874 was the Secretary of State for War in Gladstone's Liberal Government. He completely reorganized the army, rectifying its unreadiness for war and inability to provide adequate garrisons throughout the Empire, and abolishing the antiquated system whereby officers bought their commissions and promotion. In future there were to be two battalions in each regiment, one at home providing reinforcements for the one overseas, and their associated militia and volunteer battalions became the home defence force and nucleus of an expeditionary one. For officers, entry to and promotion in the army were regulated by competitive examinations. Cardwell's reforms were of vital importance to the British Empire, the country and the army. He was raised to the peerage in 1874 and died in 1886. In April 1854 the Government approached Guildford Corporation with an offer of £100,000 in return for a camp for 20,000 soldiers on the Hog's Back. This was rejected and the government then offered it to the village of Aldershot, which accepted with alacrity. In 1873, however, Edward Cardwell, who lived at Eashing and was Secretary of State for War in Gladstone's first ministry, decided that Guildford, like all county towns, should have a barracks. Stoughton, still mainly open fields at the time, was selected as the site. 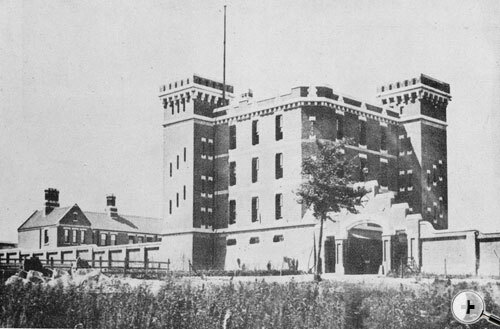 Building work was completed in 1876, including the construction of the imposing brick Keep. Occupied in October of the same year, the Queen's Royal, 2nd Regiment of Foot took up residence in the barracks then named the 48th Brigade Depot, later Stoughton Barracks.